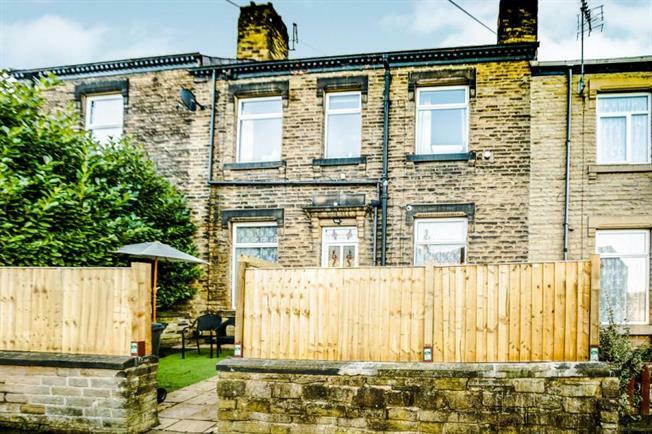 4 Bedroom Terraced House For Sale in Huddersfield for £140,000. An attractive four bedroom stone built double fronted home located in the popular location of Newsome which offers a wealth of accommodation and comprises; Lounge/ground floor bedroom, downstairs shower room, spacious dining kitchen, plenty of cellar space, four bedrooms and a family bathroom. Externally there is a good sized private enclosed garden to the front of the property, a shared garden to the rear and also permits parking for up to two cars. Gives access to the ground floor accommodation. A staircase rises to the first floor level. A newly fitted large dining kitchen perfect for entertaining which incorporates modern wall and base units, built in electric oven with four ring electric hob and extractor fan over, stainless steel sink with mixer tap over, fireplace, wood effect flooring and uPVC double glazed window. This useful, spacious cellar has a stone table and flagstone floor. This spacious, neutrally decorated lounge has uPVC double glazed windows to the front and rear elevations, a radiator and high skirting boards. This space could also be used as a ground floor bedroom if needed, as it also gives access to the ground floor shower room. Being tiled to full height, this ground floor shower room includes a low flush W.C, chrome heated towel rail, wash hand basin, shower and cubicle, wood effect flooring and wall mounted vanity mirror. Currently being used as the master is the double bedroom which includes uPVC window, wood effect flooring and inbuilt storage cupboards/wardrobe space. A spacious double room with inbuilt storage and wood effect flooring. The property benefits from double glazing and central heating throughout. Externally there is a enclosed private garden to the front of the property, permit parking for up to two cars and a shared area to the rear.